The real stories behind 디즈니 princesses. from About-Face. Wallpaper and background images in the Feminism club tagged: cartoons disney female characters stereotypes sexism. I see Mulan's missing. And for a good reason. ^ I was going to say, Mulan don't belong there. Although I have to admit Jasmine is my favorite Princess. I agree with most of this except for the fact that Belle was seen as very smart and men made fun of her for it, so I never thought of it that way. Jasmine isn't terrible either. She kind of rebelled against her father. With Belle I think the point is the man can look beastly and hideous but women are encouraged to look past appearances to inner beauty, yet this is never reciprocated, ever. The woman must always be perfect and beautiful on the outside to be loved. ^ That is very true. Yeah, like how she was treated because she was intelligent. She was seen as a freak. Why do people get mad about Ariel leaving her family to be with Eric? I thought it was normal for a woman to leave her family once she gets married. My mom rarely saw her family after she married my father. My dad didn't see much of his family either (except his brother) after marrying my mom. Besides, he was raised in a culture where a woman who marries her husband doesn't see her parents so much. Ariel didn't change for a guy. She honestly wanted to be human. Her father had the power to make her human, but he was so prejudiced that she had to turn to Ursula. For a real world version, substitute "human" for "a citizen of a foreign country" and consider Ursula a coyote. The film's got problems, but it's not as bad as people make it out to be. LOL, thank goodness for Mulan and that one woman from "The Princess and the Frog". And I haven't seen Tangled, but from the commercials, it looked like the protagonist is pretty confident and audacious. 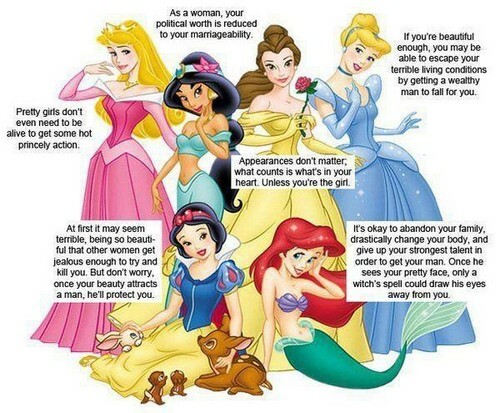 Tiana,Pocahontas,Rapunzel,and Mulan are missing because they dont fit in this logic. They are strong women. This! is why i have allways hated disney princesses! I KNOW! I especially agree with Belle and Cinderella. Looks matter TOO much and it's their ONLY ability. Also, their only mission in life is to get a man. Nice thing to teach young girls... including me! EW! Honestly what contributions was Ariel really making at home anyway? I think they could get by without her. They missed out for Snow White: If you cook and clean for a bunch of ungrateful demanding men, they'll give you a roof over your head. Sleeping Beauty- Flora kills the Dragon. And Aroura in the picture WANTS to be kissed. Jasmine- women had to fight for the right to choose who to marry.